Dontronics World’s largest range of Microchip (PIC) and Atmel (AVR) Hardware and Software. They have many kits for Embedded SBC from small ones to the powerful types that run Linux. Dontronics is a small family owned business run by Don McKenzie, and operated from Tullamarine Australia. Products Sold Include Codevision AVR C Compiler, Xbee Boards. ARM, Atmel and PIC Microchip Evaluation and development boards. Arduino and Breakout Boards with many types of interfacing connectors and cables, Conversion cables for Serial, USB and Other Interfaces too. Regular parts and tools too. Don McKenzie. P.O.Box 595, Tullamarine 3043, Australia. eShop and How-To Videos for anyone who has an interest in Microcontroller Programming & Development. Components and Kits for the Electronics Enthusiast. A site designed for electronics and prototyping hobbyists and enthusiasts. This site has grown and is now a useful knowledge base and online shop for anyone who has an interest in Microcontroller Programming & Development or for anyone who has a love of electronics. These are Tiny Chips that integrate the Microprocessor and Peripheral chips in a compact size with low power consumption. PIC Microcontrollers from Microchip are the evolved computing digital devices that go into many gadgets and intelligent equipment. These are easy to program and reprogram and even protect your code or IP. The PIC has the math power. The memory, the I/O ports are integrated in the chip like 8051. Some may remember that Microprocessors like 8085 and Z80 had all these functions in chips outside and used to consume more power. Then came CMOS and better IC technology. The 8051(now avr, atmega)and PIC Micro are entire boards in one chip. The above tutorial gives the History of computers, microprocessors and the details of PIC Micro’s Internals. PIC Tutorials and Gooligum baseline and mid-range PIC training and development board. Introduction to PIC Microcontrollers,Baseline PIC Architecture and Assembly Language, Baseline PIC C Programming, Mid-range PIC Architecture and Assembly Language – Quite a few are free and can be read online. Starting with PICmicro controllers by Wouter van Ooijen. PICmicro is the brand name for a family of microcontrollers manufactured by Microchip. The PIC acronym stood for Peripheral Interface Controller, but recently Microchip has renamed their chips to PICmicro. Within this family the flash-microcontrollers (16×84, 16f62x, 16f87x) are ideal devices for hobbyists and low-volume professionals. Learn to program in C with FED – This manual will take you through the process of learning C from variables through constants to pointers and then structures and unions. Most of the examples are standalone and are as small as possible to enable the purpose and effect to be easily understood. Open Source Electronics. Hardware and gadgets. Embedded Cards with Support Cards and Components. Be in Sync. with the Embedded Electronics for Quick Prototyping and Gadget Creation. There’s enough stuff in this pack to build 2 full gadgets, with a wide screen, or two player, or angled, or multi-colored, with enough power to run for over 24 hours straight. That’s pretty intense. If you think you can handle it, the Ultimate Gadget Pack’s the perfect kit! Neapolitan pizza of Open Source hardware and Arduino modules. James Newton of Massmind.org helps hosting the piclist site and editing and organization of the PIC FAQ. The PICList mailing list is hosted by MIT. The design is essentially a double evaluation board for the chips 18F4550 and 16F877A. 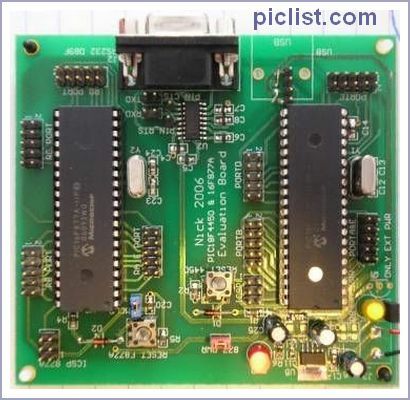 It contains also a MAX232A serial module having two transmitters and two receivers with the ability to connect either to 4550 or 877 microcontroller. Each microcontroller port ends up to a pin header in order to give interconnection capabilities to the board for future experiments. Author of books and CDs, Microcontroller, interface programming or new ideas for hobby projects. The Electronics Fundamentals for hobby and education helps the beginner with valuable information. The electronic logbook is amazing, you can have a look at so many circuits and projects with photos. You will learn many things and make you develop skills. Adafruit Industries is a small company that sells kits and parts for original, open source hardware electronics projects featured on ladyada as well as other cool open source tronix that I think are interesting and well-made. Atmega328 chip has twice as much storage, runs at 16.00 MHz, just like the latest Arduino. Upload baud rate is 57600, use Arduino IDE v13+. Chip comes preprogrammed with my “no-wait” Arduino bootloader.